Ousted Egyptian president Mohamed Morsi, along with 14 other defendants, was sentenced on Tuesday to 20 years in maximum security prison and five years of parole over the killing of demonstrators outside his palace in 2012. 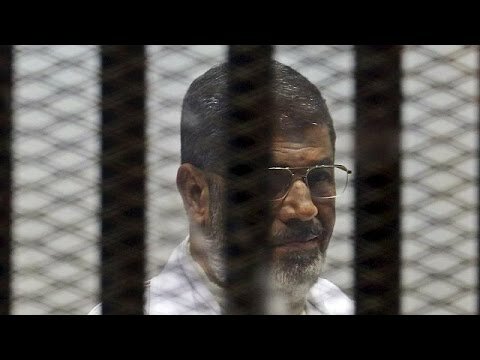 Morsi, the country’s first democratically elected president, was convicted of ordering the arrest and torture of protesters during the clashes that erupted in December 2012, following his decree that all of his decisions and the laws he issued were immune from challenge and could not be overturned. The charges stem from the Ettehadiya Presidential Palace violence, in which ten people were killed and many others injured, including supporters and opponents of the president and former leader of the Muslim Brotherhood. The Cairo Criminal Court acquitted the former president—who was ousted in a 2013 military coup—of murder charges that could have seen him face the death penalty. Hearing the verdict, Morsi and the other defendants gave a four-fingered salute, a symbol of the deadly clearance of Brotherhood supporters at the Rabaah al-Adawiya mosque in 2013. A senior Brotherhood figure, Amr Darrag, called the ruling a “travesty of justice”. “They want to pass a life sentence for democracy in Egypt,” he said. International human rights groups denounced the legitimacy of the trial and the politicization of Egypt’s judiciary. “This verdict shatters any remaining illusion of independence and impartiality in Egypt’s criminal justice system,” Amnesty’s Hassiba Hadj Sahraoui said in a statement released Tuesday. But some argued for some small measure of accountability for the violence, however imperfect.